I sat in the sun on the edge of the jetty while I waited for the boat to come in. But they made me get up and stand behind a fence to avoid the small risk that I might, somehow, fall in the harbour. Could you put your seatbelt on please … take your bag off the seat … can you pop that in the cloakroom … please don’t touch that … you’re not allowed up there … excuse me, that’s not safe … can you move back towards the wall, if you don’t mind… due to safety regulations… stand in a line, please … for the safety and comfort of all our passengers … could I see your ID again…and, erm, if you wouldn’t mind just WAITING there…. 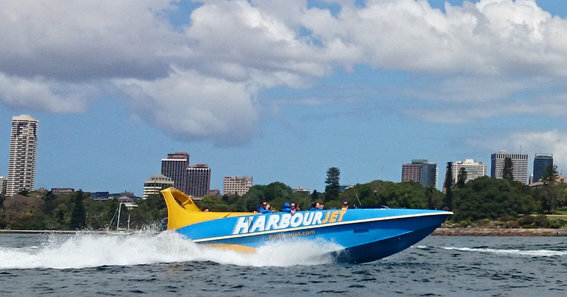 The jet boat had the pugnacious look and deep-throated growl of a racing powerboat, but worked like a jet ski with a big inboard motor which forced water from under the hull out the back. It went like stink, stopped in its own length and could be encouraged to spin like a coin on a table. EDM pumped from the speakers at the back; the passengers punched the air. The skipper eased out of the harbour, past the Opera House, into open water, soundtracked by Avicii’s Levels. He whacked open the throttle, the motor snarled, the boat stood up on the plane and lunged towards the Heads. Then he flung the wheel over to starboard and held it in a tight turn while the passengers, feeling the G, gripped the bars on the seats in front; and straightened up, hurtled forward, and flung the wheel over to port. Straightening up again then, and pounding ahead, the skipper chopped the throttle and locked the wheel and the boat whirled round its axis, sending a mini-tsunami over the whooping, shrieking passengers. Throttle back open, streaking across the bay, a brutal crash stop, an incredible deceleration, like nothing I had experienced before in a boat or car; another wave consuming us; soaked through to the pants. Throttle wide open again, on course to ram the Manly ferry, then skidding away; then spinning around a buoy; more spins, more crash stops, more screams, more whoops, more Avicii, more soakings, then slowing and sliding back into harbour. I peeled off my t-shirt, wrung out a gallon of water and drip-drip-dripped up the quay. I like your comparison between Aus and Asia. It’s true we are adults but don’t get to use our instinct much. It’s true we are trapped in a corporate world. I wonder how we can get out? I’ve got out for the moment (for three years so far) but I’m not sure what I’m going to do longer term. I realised, though, that I didn’t need a quarter of the stuff I used to think I needed, so with luck I won’t need to go back to sitting in an office getting shouted out for 10, 11, 12 hours a day.